The next recipe I made from the Hershey Cookbook was totally and completely scrumptious and totally redeemed the other two I tried. It was also a sweet! Not just any sweet a yummy breakfast sweet. These cinnamon rolls gone chocolate were the ‘icing on the cake’ to a hearty ‘breakfast for dinner’ meal Eric cooked up a few nights ago. After we ate his tasty breakfast concoction he asked if the ‘dessert’ I made was ready. It was and we devoured these. Eric asked (after we had ingested several of these little delights) if this could always be our “breakfast dessert”! Folks I think that is a sure sign of a winner! These little breakfast goodies were soooo so easy and used ingredients I always have on hand. And since they are kind of ‘self-frosting’so you can just pull them out of the oven and serve. Notes: I followed the recipe pretty closely. I did add cinnamon the the filling mix to make them a true “Chocolate Cinnamon Roll”. Also the original recipe said to cook these in mini muffin pans but I didn’t read that part and used a regular sized muffin pan and just put 2 to 3 little ‘rolls’ in each muffin pan. Melt 6 tablespoons butter in small saucepan over low heat; add brown sugar, 3 tablespoons cocoa and water. Cook over medium heat, stirring constantly, just until mixture comes to boil. Remove from heat; stir in vanilla. Spoon about 2 teaspoonfuls chocolate mixture into each of 48 small muffin cups (1-3/4-inches in diameter) OR 12 large muffin cups. Set aside. Unroll dough; separate into 8 rectangles; firmly press perforations to seal. Melt remaining 2 tablespoons butter; brush over rectangles. Stir together granulated sugar and remaining 1 tablespoon cocoa; sprinkle over all rectangles. Starting at longer side, roll up each rectangle; pinch seams to seal. Cut each roll into equal pieces. Press 2-3 pieces gently into prepared pans, cut-side down. Bake 11 to 13 minutes or until light brown. Remove from oven; cool 30 seconds. Invert onto cookie sheet. Let stand 1 minute; remove pans. Serve warm or cool completely. NOTE: Rolls can be baked in two 8-inch round baking pans. Heat oven to 350°F. Cook chocolate mixture as directed; place half in each pan. Prepare rolls as directed; place 24 pieces, cut-side down, in each pan. Bake 20 to 22 minutes. Cool and remove from pans, as directed above. 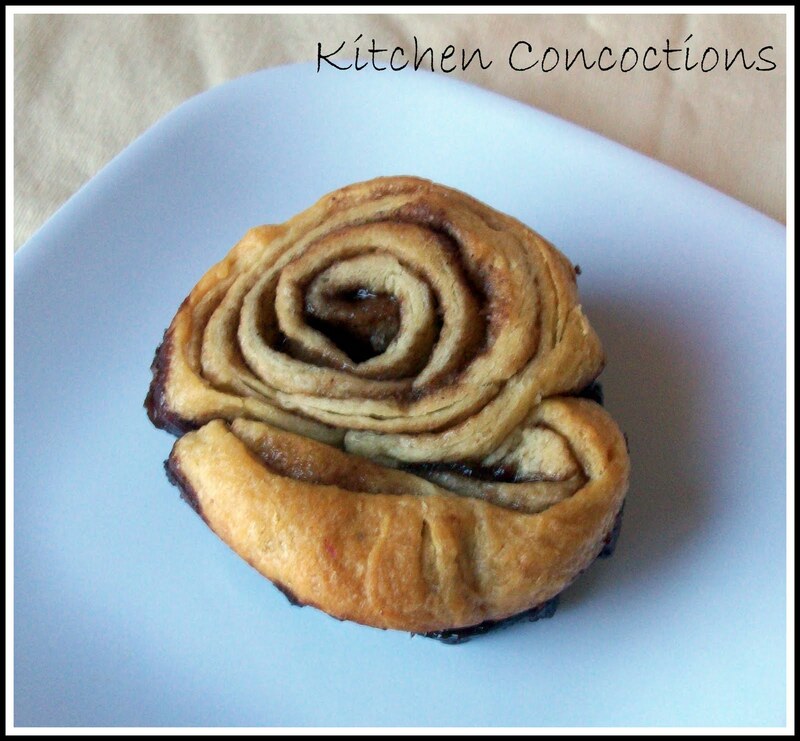 What a brilliant idea – making a chocolate version of cinnamon rolls. I love it!